Professional Share is a free WordPress plugin that is optimized for the social media buttons that professionals and B2B companies need most. It’s optimized for speed with proper placements for posts and pages. Core buttons applicable to professionals and B2B – focus is on LinkedIn and Facebook action verb “recommend”. Drive quality traffic to your site while simplifying the user experience. Full Google Analytics Social Tracking. Google Analytics reports successful shares only. Tracks shares, recommends, AND unlikes. Official button code from LinkedIn, Twitter, Google, and Facebook. Schema.org and OpenGraph meta tags for more precise sharing. 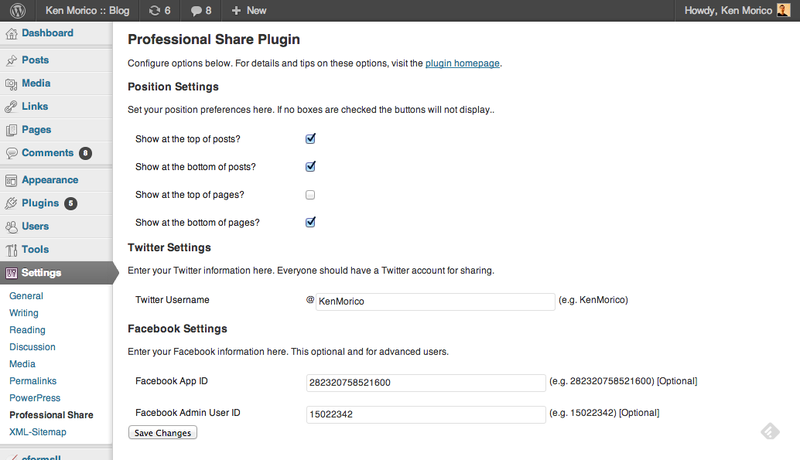 Allows Twitter username entry so Tweets can be attributed to you – (the AddThis plugin does not!). Plugin buttons can load once in the page speeding up the user experience. Buttons have flexible placements – above posts, below posts, above pages, below pages, and custom with shortcodes and the do_action function. Works on mobile, respsonsive designs and themes. Allows custom Facebook AppID and administrator IDs for deeper Facebook integration. This plugin can optimize and automate as much as possible for you, but there are some things you need to to to ensure your users see the best snippets when they share. First, write a concise and unique excerpt for your post in the excerpt field. Pages in WordPress don’t have excerpt fields, so make sure the top of your page / post is descriptive and gives the reader an idea about what they can find if they keep reading. Second, add an image to the page. Set an image as the “Featured Image” for the post. This will tell the plugin and social media sites that that image is the one you want to highlight. If you don’t fill out an excerpt field or set a featured image, things may still work out ok. The first few sentences of your post/page will be the description and the first image in the post will be the featured image. If you care about sharing and the best possible experience for your users, I highly recommend writing the excerpt and setting the featured image. The excerpt will also improve your SEO. Where Can I See My Social Reports in Google Analytics? I also created an easier Google Analytics report to track social interactions on my Free Google Analytics Custom Reports page. You’ll find some other useful reports there as well. You can download the work-in-progress Professional Share Drupal module on Drupal.org. Professional Share is a work in progress and will be updated. Check back soon. Please leave feedback / bugs below. Once activated, click on the Professional Share menu item in the settings section. Type in your Twitter username (without the @ symbol) and your Facebook UserID and AppID if you have them. The plugin works without any setup as well. Use [[professional_share]] shortcode to render buttons anywhere in a post / page. Hook to render buttons in themes – do_action(‘professional_share’) – use for Homepage, category pages, etc. Use the short code [[professional_share]] to render buttons anywhere in a post or page. Use [[professional_share show=”false”]] to hide the buttons on a per-page/post basis. Found this plugin useful? Consider donating to support improvements and future versions. I upgraded from version 1.0,1.1,1.2 to 1.3+ and cannot see my buttons? Go to the plugin settings page and check the boxes for button position. Thanks for sharing, I’m a fan of Floating social media icon. That’s because I love the icon designs. It makes my site seem like it has custom icons, same theme color scheme. I have also used AddThis as it allows people to share my posts across different platforms. Currently I’m using the social share icons included with Jetpack. The are clean and modern and load fairly quickly. Jetpack is a beast of a plugin but it really does add some useful features and enhances the WordPress app on mobile devices. I wanted to know if I could have this plugin show up in the excerpt on the homepage of my wordpress blog. Hi Gaurav. You can use the hook functionality and / or a wordpress filter. The wordpress plugin documentation should help you with that. Hello Amjad. Thank you for using the plugin. I see what you mean. On the link you sent me, the referring url is not decoded, but this url shows up in the Tweet Box: http://vizyon.me/0Paih , which redirects to your page. Do you have short URLs enabled for WordPress? Yes, after posting the comment, I found a solution. I installed this plugin: http://wordpress.org/plugins/shorten-url/ and had to customize your plugin to achieve that. I added a data-url parameter with get_short_link() as its value to the tweet button code in your plugin’s file. That did the trick. Maybe you should incorporate the short URL feature in your next update for tweets rather than tweeting the full URL. Hi Jessy. What version of WordPress are you using? Do you have any other social media button plugins? If you post your website link it might help. Thanks! Great plugin but my only is there’s no tumblr, reddit and pinterest? Anyway you can add them in the next update? Thanks soooo much for this plugin! Exactly what I was looking for, love that I have the ability to switch off the buttons on certain pages. Thank you. Awesome, looking forward to it! Add me to your newsletter if you have one. Hello Jan. This is either a CSS/code problem with Facebook or your site theme or other plugin. The Facebook button code generates the pop-up window, so this is not something I can control/manipulate through the Professional Share code. You might want to adjust the CSS in your theme. I’m having the same issue so I was looking for a way to reorder the buttons. Can I have Facebook come first? Thanks! OK, I just posted a fix in version 1.5.1. The box should display in full. Re-ordering the buttons is not something I plan on adding for simplicity sake / dev time. I focus efforts on shareability and search engine optimization. Thanks for the feedback. OK, I just posted a fix in version 1.5.1 There is some CSS in some WordPress themes that limit the width of content. I override that now and we seem to be back in business. Thanks for the feedback. Hello. Thank you for the feedback. If you delete the plugin and then add it back it should work. I updated a line of code to be compatible with older versions of PHP. You should upgrade your version of PHP to 5.3+ when you get a chance, because future plugins from other authors may require it because it is a major upgrade of PHP, the language WordPress uses. Let me know if you encounter any issues. Hello again Alex. I have taken your feedback seriously and incorporated your suggestion into the development of the new version of Professional Share. Use the new shortcode attribute to disable the buttons on a per-page basis – [professional_share show=”false”] in Professional Share version 1.4+ Thanks! Hi Darren. The feature you requested — changing the button positions is now live. Just update from WordPress. Thanks for your feedback. Nice plugin, that’s for taking the time to create it. Is there an easy way to change the location of the buttons from the top of the post to the bottom? Perhaps this could be an option in a future version, but is there a bit of code I can edit to do the same thing? Hi Darren. Thanks for the feedback. If you edit the plugin files directly there is code that positions the buttons at the top for posts and at the bottom for pages. Just move the code around and it should do what you want it to do. Hi Alex. Thanks for the feedback. Right now there is not a way to disable it on certain pages. I can add that to the updates. There might be a way to disable the plugin using some custom WordPress code and PHP for certain pages, but that’s an advanced way of doing it. I’ll try and get an update out this week.